Mobsquads — Collect and fight rival gangs on the blockchain for loot and bonuses. Mobsquads — Collect and fight rival gangs on the blockchain for loot and bonuses. A new game on the Ethereum blockchain launching at 1am GMT on the 3rd of March! 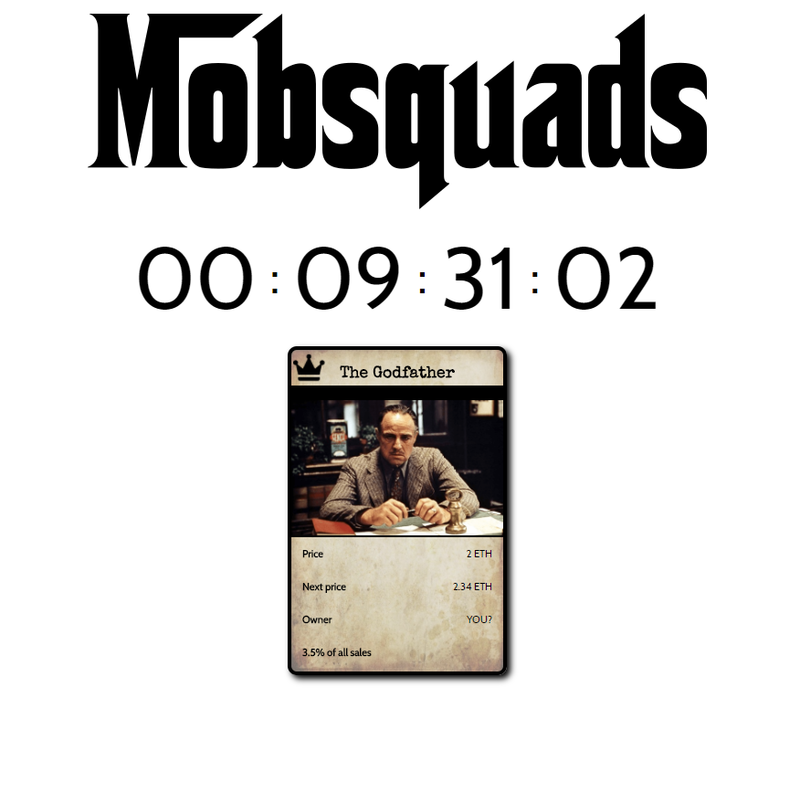 Mobsquads will not just be another hot potato flipping game, it is a strategy game with a clear incentive to play well beyond the initial rush at release. It is set in the dark and dangerous digital underworld and your aim is to take your squad to the top of the gangwar! Toast notifications of confirmations as well as possibility of bidding on purchases will make for smoother gameplay even when things heat up! As you will be able to see upon entering the game, there is a single Godfather as well as numerous squads, each with their corresponding boss and mobsters. Once you’ve picked a side, it’s time to start taking out your rivals! The most lethal squad will receive a 3.5% share of revenue from each sale of the Godfather. Once this action is confirmed on the blockchain, the rival will be injured for 1 minute and your squads lethal rank will increase by 1. As well as the above, each squad boss will get a 5% share of the revenue when one of their mobsters is purchased by someone else. Every 200 successful ‘whacks’ marks the start of a new round after which the ‘Whacking Bonus’ is shared. If you’ve arrived late to the action, take cover and wait till the new round begins before you start firing! Or perhaps you think that you’re just in time to turn the tide of the fight before the other squad can secure victory? For those who feel they have served their time fighting on the streets, you can become the Godfather. The Godfather always knows what’s going on, and so receives 3.5% of any sale on his turf.